Show your support alongside Bob’s BMW and ride to the American Legion in Dundalk, MD on August 23 between noon and five and enjoy the 5th Annual Charm City Mods vs. Rockers. If you have a vintage motorcycle or scooter, tune it up and shine it up and enter it into the show; and even if a vintage bike is not part of your collection, throw a leg over your more modern machine and join the fun: enjoy live music by Didi Deluxe & The Dirty Devils and side show entertainment by Mab Just Mab, a vintage pinup contest, food, vendors, and a vintage and retro motorcycle and scooter show. Bob will be choosing a bike from his vintage and classic collection to ride over and hopes you will do the same. Help us show the British bike riders what Bavarian Motor Works is all about! 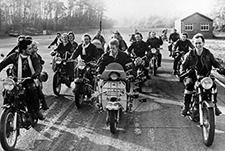 Mods and Rockers began in the early-mid 1960’s among British youths. Rockers developed a “macho biker gang image, wearing clothes such as black leather jackets” and Mods “adopted a pose of scooter-driving sophistication, wearing suits and other clean-cut outfits.” These two British sub-cultures were complete polar opposites; everything from the clothes they wore, to the music they listened to, to their overall personalities and viewpoints. There was an urban split among the two groups that often resulted in brawls and even riots. It was thanks to the spotlighted media coverage surrounding the battling groups, the term “moral panic” was coined by sociologist Stanley Cohen. Fast forwarding to today, credit is given to the Rockers for giving birth to the legendary term, “Café Racer,” one of motorcycling’s most recent and biggest crazes where youths race from pub to pub, sometimes “pulling the ton” (going 100mph) to see who has the fastest café racer. It’s an interesting point in motorcycling history which groups of motorcyclists around the country are bringing back as a unique way to rally vintage and retro motorcycles and scooters. So again, please help Bob’s BMW support this fun and local motorcycling event on August 23! For more show details, LIKE Charm City Mods vs. Rockers Facebook page and/or visit Charm City Mods. Vs. Rockers website.